ERIC DONOVAN WANTED to be an Olympian. His first Irish title came aged 11. Since then, the Athy boxer has added five senior titles to his collection and spent a decade in the IABA’s High Performance Unit, trading punches with the household names that have reached Olympic glory in that time. Despite watching his teammates light up the Olympic boxing podiums in Beijing, London and Rio, Donovan’s Olympic dream never came true. Now, at age 32, he has turned to professional boxing as a redemption. His new dream is to become a European champion. After winning his first three professional bouts, The42 followed him on his journey towards his fourth, a meeting with the Hungarian Laszlo Horvath, and delved into his past triumphs and shortcomings, to get to the heart of why he didn’t make the Olympic team and what’s changed to make him a European contender. 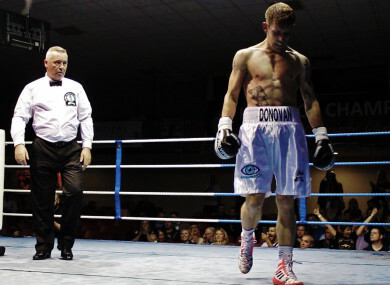 At 8am this Friday, 25 August, our full feature on Eric “Lilywhite Lightning” Donovan will be released. Below is a taste of what’s to come. Email “'Before I knew it, I was in the dressing room with my head in my hands, and it's all over'”. Feedback on “'Before I knew it, I was in the dressing room with my head in my hands, and it's all over'”.